The Thrill Of The Wild: How much work should WoW be? How much work should WoW be? Over on WoW Insider, Adam Holisky had an interesting editorial about some of the changes that have happened, and are coming to WoW. 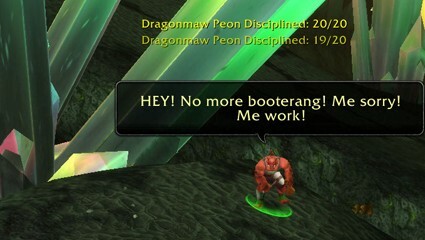 In it, one of the subjects he briefly gets into is how WoW used to be much more of a second job than it is now. Way back whenever, just to get ready to go into a raid you had to spend hours and hours farming mats and the appropriate resistance gear. This made a pretty interesting framework for The Grumpy Elf's post today, which is about how much you should sacrifice for your guild, which led me to what I want to talk about, while we're having another lull in hunter info. Whether for your guild, or for your own advancement, how much work should WoW be? In real life, I work with a couple different non-profits here in Chicago. At some point, I went to this training which was mostly about how to best work with volunteers. One of the presenters had an interesting approach; she said that we should treat volunteers like employees, giving them real responsibilities and expecting them to be done. Her point was that if we just come up with pretend work for them, our volunteers won't really get invested in the organization, but if they have real responsibilities and real expectations, they'll feel like they're really needed, and are more likely to be around for the long haul. In actual practice, it turns out some of our volunteers thrive on that style, they love to feel needed and like they have real responsibilities. Others, especially among our very well-to-do donors, really just come volunteer, I think, to sort of appease their guilt, but don't really want do much work. Our goal then is to figure out how to keep both of those types of people wanting to be involved with our organization. In my experience, a guild is very similar. For one, we're all volunteering to be there. And second (especially in today's game where most players first guild are those terrible built-to-sell guilds that send out mass invites in the starter zones) we've got to figure out how to make players feel invested in our guild, so they want to be there. For me, I need to have "work" to do to feel like part of the team: that could be something simple like keeping a tab filled with herbs or enchants; or it could be something like going over logs after raids. Whatever the job is, I need to be doing something or I'll feel like I don't really matter. This is true not just in preparation, but while actually raiding, as well. When raiding on an alt in a PuG, even if I'm doing plenty well enough to clear the content and am just with better geared people, if I'm at the bottom of the damage done meters, or at the top of the damage taken meters, it feels like my contribution isn't important, and I'm being carried. That's actually one of the reasons I like Seigecrafter this tier, because I had a job, and I couldn't just be replaced with any random schmuck: my contribution mattered (even if it's frustrating to not be able to really DPS). On the other side, enough work to feel involved can quickly turn into too much work and burning out. One player might get a lot out of being responsible for keeping the guild bank stocked with herbs, but if you add to that keeping the guild bank stocked with gems, and 'chants, and pots, they'll at best feel burnt out because they "have" to log in and fill the guild bank, or at worst feel like they're being taken advantage of. The same holds true while raiding. As much as I don't want to be carried, and want to feel like my contribution matters, feeling like you're carrying too many others, week after week, can be just as bad. The other week we brought in some newer people, just to get things done, and I was tanking. We cleared up to klaxxi and some of the players who were on alts needed to switch to their mains to get thok, blackfuse and klaxxi down because the fill ins just could not cut it. I felt bad for the core people who wanted to gear alts for having to switch to their mains just to down stuff because people in all 560 gear could not even muster 120K. Each week I take someone aside, each week I work with them, each week I explain what they can do better, and each week they still play poorly. I used to take this with a grain of salt and would keep trying to help because I "wanted" to but lately if I want to raid it I feel like I "have" to. Just like I "have" to tank or I "have" to be around to start the second group. Unfortunately for guild and raid leaders, and even for blizzard, it's a very fine line between burn out and not feeling invested. Not only is that line at a different place for different players, it's also at a different place depending on where in a tier, and where in an expansion we are.